PLEASE find below quotes from the press conference for Frank Warren’s big card at Leicester’s Morningside Arena on Saturday February 23, live on BT Sport. 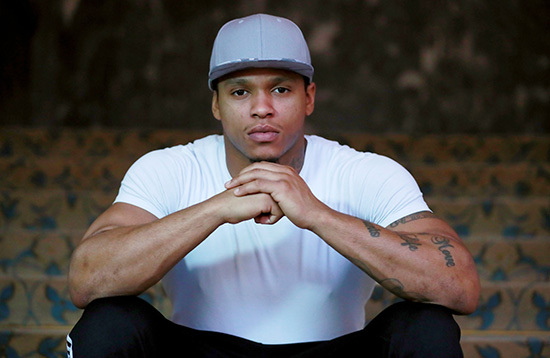 Anthony Yarde (17-0) defends his WBO intercontinental light-heavyweight title against Mehdi Amar (35-6-2). Super-featherweight Lyon Woodstock (11-1) and super-lightweight Sam Maxwell (10-0) are also in action, while there is a Leicester derby between CJ Challenger (9-0) and Kyle Haywood (8-0) with the Midlands Area super-welterweight title on the line. “Yet again Clark pulled out. It is ridiculous and I don’t know why he wanted the fight in the first place. We want Sam Bowen to defend his British title if anyone has the balls to step up, but he will be fighting. Sam is talented, does the job in style, dedicated and the chances will come. 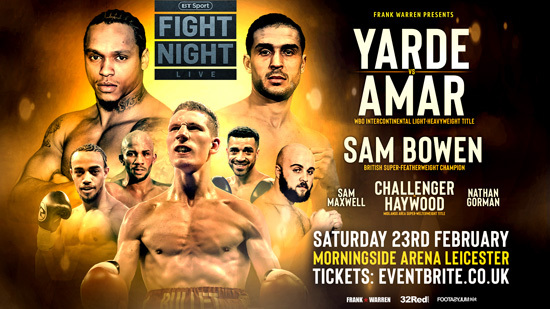 Headlining the show at the Morningside Arena is British super featherweight champion Sam Bowen and is joined by light heavyweight Anthony Yarde as he takes on former European champion Mehdi Amar in the evening’s co-headline fight. Local fighters CJ Challenger and Kyle Haywood do battle for the vacant Midlands Area super welterweight title. Nathan Gorman, Sam Maxwell, Lyon Woodstock, Willy Hutchinson, Ryan Garner, Tommy Fury, Ryan Hatton and Mark Chamberlain also feature on the card.